If you’re looking for a penetrating and even modestly accurate dramatic depiction of the life of Harry Houdini, the legendary escape artist, this is probably not it. If, however, you’re looking for a tremendous performance from a great star in his peak years, you could do a whole lot worse than “Houdini”. The handsome, virile Tony Curtis commands the screen so voraciously that it feels almost like a one-man show. It isn’t, however, since he’s supported by the mouth watering Janet Leigh as Houdini’s long-suffering and only moderately supportive wife. Directed by the prolific hack George Marshall, “Houdini” is a strangely watchable Hollywood biopic. In spite of a script by Philip (“Broken Lance”, “Detective Story”) Yordan, the movie really doesn’t have one of the strongest narrative arcs in the world, but in spite of this it entertains – mostly due to Curtis, but also because Marshall is smart enough to keep his camera trained on the gorgeous leading man so that much of the story is in the title character’s space for much of the picture’s running time. While, the movie plays fast and loose with many of the actual details of Houdini’s life, one gets a strong sense of his drive and charisma and, in so doing, captures the mythic essence of Houdini. Part of “Houdini’s” considerable entertainment value is probably due to the fine attention to production value from powerhouse producer George Pal who crammed the picture with as much wonder and star-power as could only come from the man who produced and/or directed some of the finest entertainments of the 50s including “The Time Machine”, “Tom Thumb”, “War of the Worlds”, “When Worlds Collide” and, among others, that great series of animated “Puppetoons” that included the likes of “Tubby the Tuba”. It was Pal, no doubt, who saw what a perfect Houdini Tony Curtis would make. Curtis plays the title character as a driven man – driven to romancing the woman of his choosing, driven to success and driven to seeking greater and more dangerous challenges. While Marshall doesn’t have much in the way of a distinctive directorial voice, he spent much of his career capturing star performances and exploiting them to the hilt. Much of Marshall’s best work was in comedy and he trained his workmanlike eyes on such stars as Bob Hope, Martin and Lewis and Jackie Gleason. He also had one great movie in him – “Destry Rides Again”, a great lightweight western with Marlene Dietrich and James Stewart that never fails to entertain. “Houdini” is almost up there. The plot, such as it is, begins with a typical Hollywood meet-cute where Houdini catches a glimpse of the gorgeous Bess (Janet Leigh) from his vantage point behind a circus sideshow cage where he is made-up grotesquely as a jungle wild man. He keeps wooing her as a wild man, but when she catches a glimpse of him without the makeup, she’s also smitten. They quickly marry and begin touring circuses and honky-tonk vaudeville houses as a husband and wife magic act. Soon, this life grows wearying for the wifey and she begs Houdini to settle down and take a real job. He does, working at a factory that – conveniently – designs and builds locks and safes. Here he becomes obsessed with the notion of death defying escapes. He soon convinces wifey and re-enters the world of show business, becoming bigger than ever imagined. Marshall expertly handles the escape routines in “Houdini” – so much so that even though WE know Houdini’s going to beat them hands-down, we still feel considerable suspense as each one is presented. A lot of the credit for the suspense generated in these scenes must go to Curtis and his performance – alternating as it does from boyish wonder to driven madman. Curtis plays Houdini as no mere entertainer, but someone who is not personally satisfied unless he is cheating death every step of the way. Nothing like a babe-o-licious harridan to keep a good man down. Luckily, she doesn’t. The movie forges on with one daring stunt after another and luckily, one of Miss Leigh’s harridan-o-ramas is certainly not without entertainment value. The sequence involving Houdini’s preparations for his famous dip into the icy waters of the Detroit River are as hilarious as anything I’ve seen recently. Tony Curtis lying in a claw-footed bathtub covered in ice cubes while a team of men pour more bucket loads on top while wifey nags at him is not only funny, but chillingly (if you’ll forgive the pun) reminiscent of numerous moments I’ve experienced or heard about or, even witnessed, with old wives and girlfriends of both myself and other men close to me (they know who they are – the men, that is). And while I wish to divulge the wildly, wonderful and weepy Hollywood ending which bears absolutely no reality to the real Houdini’s death, suffice it to say that Leigh removes the mask of the harridan long enough and Curtis emotes so expertly that it’s a tear-squirting corker of a finale. And that is worthy of all the Technicolor glory lavished upon this terrific little gem. 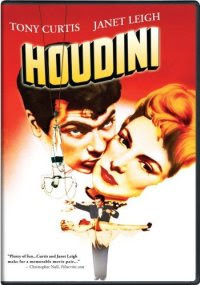 “Houdini” is available on DVD from Legend Films.